The complexity of feet is amazing. Despite their relatively small size, they contain 25% of the bones in the human body (along with over 100 muscles, tendons, and ligaments). It should be no surprise that they can develop various structural issues and abnormalities. When we consider one of them—pediatric flatfoot—you may be relieved to learn that what you see as a problem might not be cause for concern. 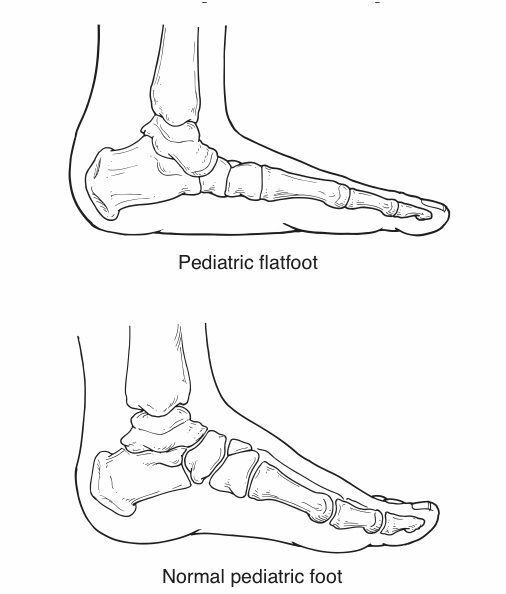 A key to understanding pediatric flatfoot is knowing how the foot actually develops from birth to childhood to full maturity. When you do, it will help clear up some needless concerns that many parents (especially new ones) have. To start, a child is not born with fully-developed arches, or even anything close. Instead, children initially have pads of fat that obscure the arches. It is completely normal for arches to not even be seen until around 3 years of age. During this time, toddlers have extra stability as they take their first steps and learn how to get around on two feet. Beyond the age of 3, foot arches will keep developing until around 8 years of age. Until then, it is not uncommon for children to have a flexible flatfoot condition (more on that in a moment). During this time, the arch is flexible and has not completely solidified. For a majority of children, this does not cause pain or other issues. The condition may be worth monitoring, though, since the overpronation that comes with pediatric flatfoot can increase the risk of juvenile bunions. After 8 years old, a child’s arches will be more or less formed to what they will be going forward. If flatfoot is still present, it is possible that the condition will not cause any symptoms or problems. When we look at child foot development, we use a term that you might not be familiar with—flexible flatfoot. We use the “flexible” designation to separate this condition from a case of flatfoot that is rigid for a specific reason. In flexible flatfoot, a child’s feet will appear to be flat and lack arches when he or she is standing or walking. Once bodyweight is taken off the feet, like when a child is standing on tiptoes or his or her feet are dangling while sitting, the arches will be observable. In many cases, this is a transitionary state while the arches continue to develop. Some individuals, though, carry a flexible flatfoot condition with them all the way into adulthood. One potential concern when it comes to flatfoot is overpronation. When done in an efficient, moderate manner, pronation is a useful biomechanical process that plays an essential role in the distribution of forces on the foot. In this case, “moderate” refers to an approximately fifteen percent inward roll. When the roll is in excess of that degree, it is known as overpronation, and this biomechanical abnormality is quite common for those who have flatfoot. Too often, bunions are thought of as issues that only adults, particularly women, develop. While it is true that a vast majority of bunion cases happen to adult female patients, the fact remains that children can also end up with these common toe deformities. The risk factor for this condition tends to be higher for those who have flatfoot. When children overpronate, extra force is placed on the inner edge of the foot. This causes an issue for the metatarsophalangeal (MTP) joint of the first toe. The MTP joint is where the toe connects to the foot and a bunion is an MTP joint that protrudes out as a result of structural imbalance. Not all children with flatfoot develop bunions, but it does increase the risk. As a general rule of thumb, a case of pediatric flatfoot that does not cause painful symptoms or restrict a child’s ability to perform physical activities (sports, etc.) will not require treatment. In such a case, it might be best to simply monitor the situation and have us evaluate it on an as-needed basis. When child foot care services are needed, though, remember that Austin Foot and Ankle Specialists provides the expert care you want for your son or daughter. Contact us for more information by calling (512) 328-8900 or take advantage of our online form to request an appointment with us today.